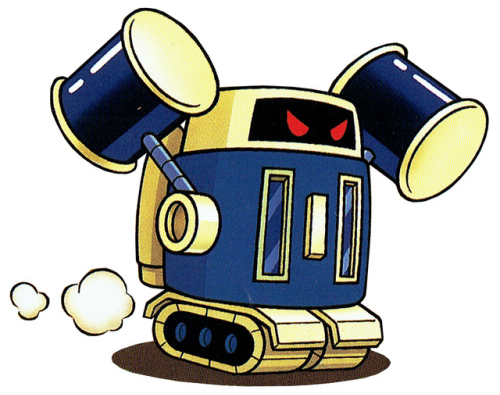 Hammer-bots are enemies commonly found in Wario Land 3. The Hammer-bot is a blue, cylindrical robot that rides on continuous tracks. If Wario gets near, it starts swinging its hammers. If it lands a hit on Wario, he turns into a spring, which allows him to reach greater heights than he would with normal jumping. The Hammer-Bot is considered a large enemy, roughly the size of Wario himself. They can be destroyed in one hit with an upgraded pair of overalls, an upgraded pair of gloves or a powered-up shoulder charge. Otherwise, it takes two hits to knock them off-screen. In Dr. Mario 64, the Hammer-bot is one of the villains that is encountered throughout Dr. Mario and Wario's journey to retrieve the Megavitamins from Mad Scienstein. He is sent by Rudy to deal with the approaching Dr. Mario and Wario, and is encountered a short distance outside Rudy's hideout. This results in a four-way battle between Dr. Mario, Wario, Mad Scienstein, and Hammer-bot in either story. Once the other three are beaten by the player, Mad Scienstein will continue to Rudy's hideout with Dr. Mario and Wario in pursuit, leaving the broken Hammer-bot behind. Hammer-bot is also playable in the game's two-player mode; this is the only game where the Hammer-bot is playable, excluding the port in Nintendo Puzzle Collection. Hammer-bots are similar in appearance to Spear-bots and their relatives. ↑ Wario Land 3 English instruction booklet, pg. 26. ↑ Wario Land 3: Fushigi na Orgel Japanese instruction booklet, pg. 26. This page was last edited on December 8, 2018, at 08:56.